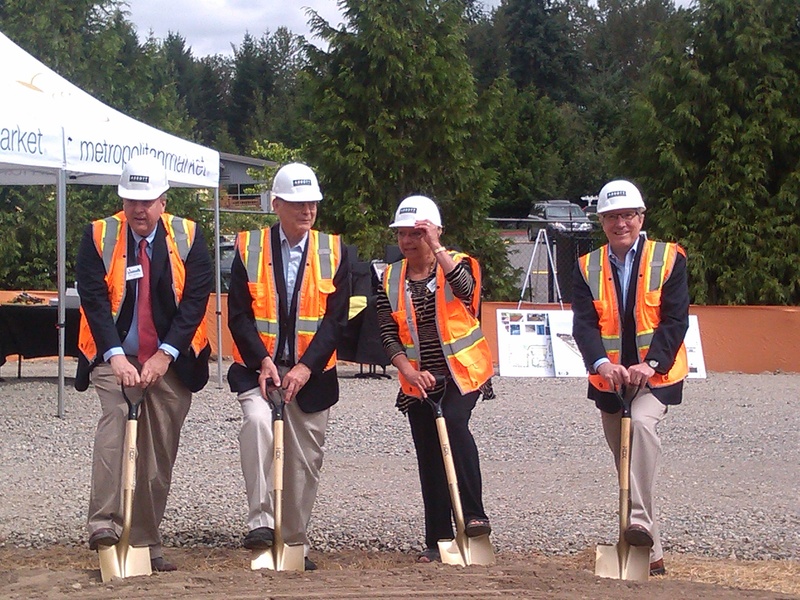 Sammamish City Council members participate in the ceremonial ground breaking for the Village at the Town Center, anchored by Metropolitan Market. L-R: Mayor Tom Vance, Council Member Don Gerend, Deputy Mayor Kathy Huckabay and Council Member Bob Keller. Vance and Keller served on two planning commissions that created the Town Center Plan. Scott Hamilton, editor of Sammamish Comment, served with both on the two Commissions, also participating in creating the Town Center Plan. Click on photo to enlarge. Photo by Scott Hamilton. The first commercial/retail center for the Sammamish Town Center broke ground this morning at the corner of SE 4th St. and 228th Ave. SE. This is a major milestone in the history of Sammamish. The Town Center plan was some six years in the making, involving five citizen committees and commissions comprised of about 70 citizens; City Councils spanning 2004-2010; and staff time to this day. Hundreds of citizens participated in charets and public meetings over the course of this time. The creation of the Town Center Plan truly began in about 2004. The area, roughly bounded by an area extending to the Mars Hill Church on 228th (the church lies just outside the northern boundary) to Skyline High School and Mary Queen of Peace on the north; and from the Eastside Catholic High School (which is outside the Town Center) on the East to roughly 222nd St. on the West. The Sammamish Commons is part of the Town Center Plan. This is the “Sammamish Comment.” So why am I spending so much time on a water fight between Issaquah and the Sammamish Plateau Water and Sewer District and the proposed annexation by Issaquah of Klahanie? Because of the impacts on Sammamish, which could be profound. The water fight and the annexation are the crescendo of long-running disputes between Sammamish and Issaquah, in which Issaquah has basically stiff-armed Sammamish at nearly every turn–most notably years-long efforts to adjust the financial contributions of the many partners in the Eastside Fire and Rescue (EFR) service. Sammamish, by assessed value of the homes and land, pays the largest share into EFR. But Issaquah generates more calls. By Sammamish’s analysis, Issaquah should be paying about $500,000 a year more than it is based on the actual calls. Issaquah refuses to adjust. Relations between Sammamish and Issaquah have reached a breaking point. Sammamish will decide soon whether to withdraw from EFR and form its own fire department or possibly even an alliance with Redmond. Sammamish has warned that if Klahanie annexes to Issaquah, Station 83, more commonly known as the Klahanie fire station–which is owned by Sammamish and located at SE 32nd and Issaquah-Pine Lake Road–may be closed. Issaquah, according to our information from Sammamish, has already told our leaders it won’t buy the station. This didn’t stop the Issaquah police chief from telling Klahanie residents that he could co-locate a police sub-station at the Klahanie fire station, a comment that came as a surprise to Sammamish officials. Issaquah’s arrogance over EFR matters–and the continued unfair financial burden Sammamish taxpayers have because of Issaquah–is an issue unto itself but it’s also tied to the Klahanie annexation.